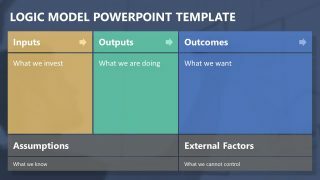 The Supply Positioning Model PowerPoint Template is the graphic presentation of business sales concept for suppliers. 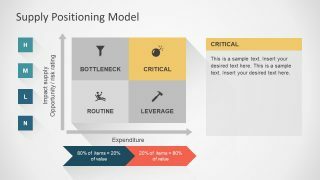 The PowerPoint of four segment matrix displays the profit potential and supply risk model with interactive set of graphics. 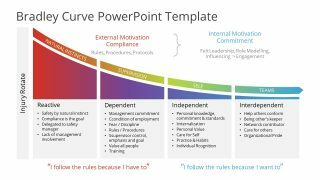 The colorful template design gives a modern view to model for maximum audience engagement. 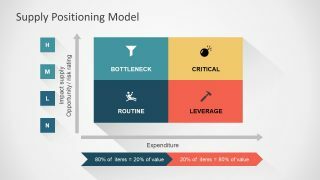 However, the supply positioning model assists the businesses to develop and implement the right strategies. Also, it is the way businesses rank their sources of supplies using several factors to determine their performance. It also evaluates the level of vulnerability and damage if a supplier fails. 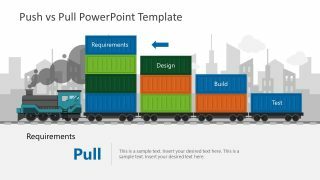 This PowerPoint template aids as a visual for prioritizing the tasks by developing supply chain strategies for the company. 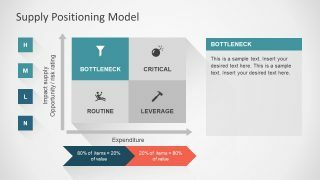 Bottleneck: It includes the items that may halt the smooth running of processes. For example, the loss of internet connection due to technical fault causing breakdown for all communications. Critical: The items which are not available or deliver on time. This affects the profitability in operations and also, changes the expenditure value. Routine: This contain the items least critical to the business. 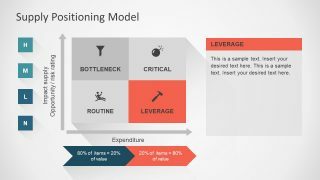 Leverage: Although the items are least critical in leverage as well, however, the spending value is high. 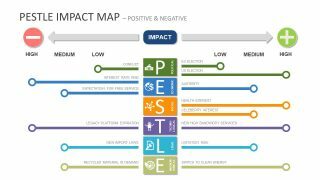 This model presentation of supply positioning is a colorful template of infographics and PowerPoint shapes. 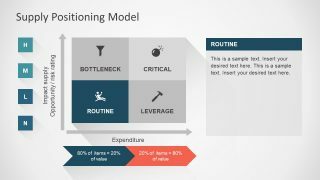 These infographics, such as, funnel, bomb, man on relaxing chair and hammer are all the visual representations of terms. Therefore, the graphics can assist the audience to create a mental image of the concept.